This 50 Non-Candy Easter Basket Items post did well back in April so I thought I’d re-visit the concept for Halloween. These days everyone seems to have some sort of restriction – gluten-free, allergies or whatever reason they may have for not eating candy. 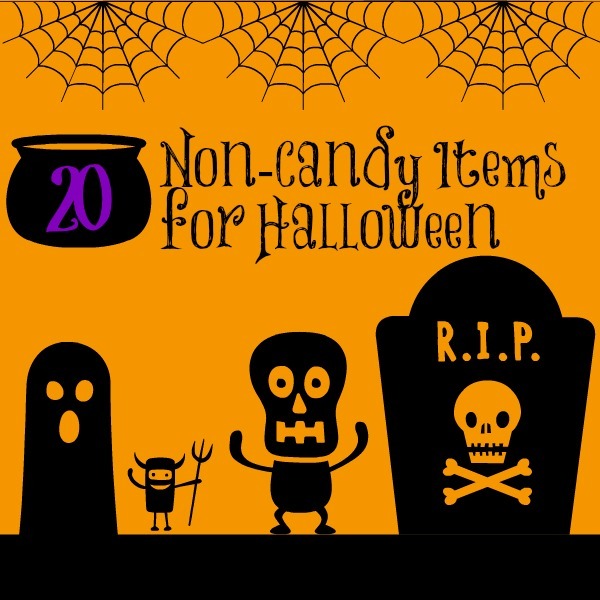 And honestly, we don’t have any restrictions but my boys get so much candy in their Halloween bags each year that I end up throwing out most of it in the end! My kids always gravitate towards the toys and other non-candy items in their bag. Pretzels, Goldfish and other non-candy but decorated snack bags work too if you aren’t worried about allergies. Do you have any good suggestions? Comment below and I’d love to add it to the list. So you need one more…how about a slinky?? OMG Kristen, you are right! Thanks for pointing that out – see what Mom brain is doing to me? Took you up on your Slinky suggestion because that’s perfect! Thanks!